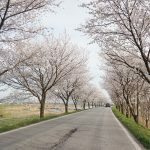 Worried about piling on weight and thinning purse thanks to mukbang(social dining) tour in Jeonju? 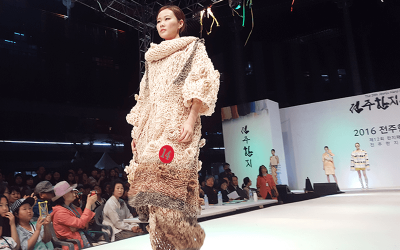 Looking for something meaningful and extraordinary to see and experience in Jeonju? Today we will introduce you to a Jeonju tour that explores the birthplace of Joseon Dynasty. 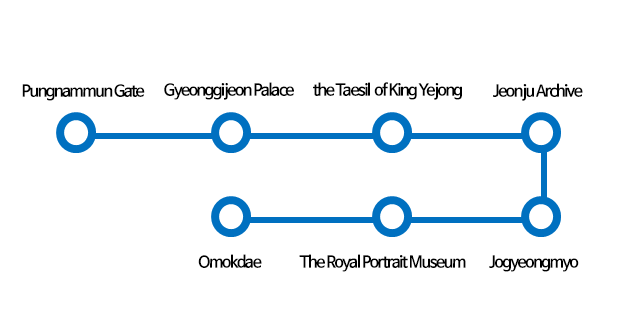 This is today’s itinerary starting from Pungnammun Gate, via Gyeonggijeon Palace, and finishing at Omokdae. Lets start from Pungnammun Gate! 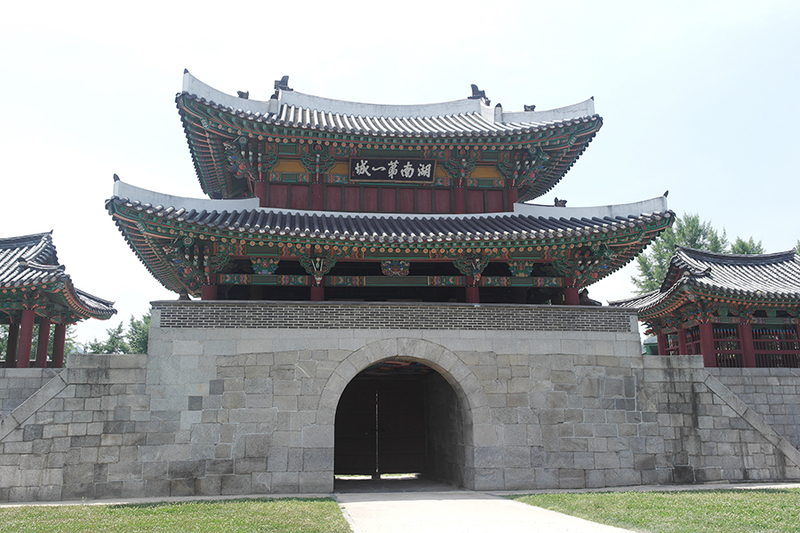 Pungnammun Gate was built by Choi Yu-Gyeong, the Governor of Jeolla Province around the end of Koryo Dynasty. Pungnammun Gate is the south entrance of the wall that used to surround the Jeonju village and the only one left among the four gates. 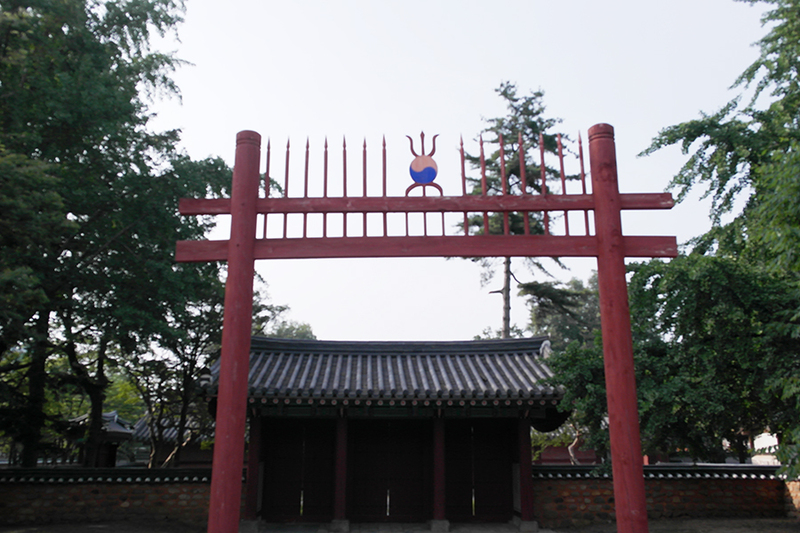 The gate was destroyed during the Japanese invasion of 1592 and rebuilt during King Yeongjo of Joseon. The gate was destroyed again by fire but rebuilt in 1767 by the Governor Hong Nak-In. He named the gate “Pungnammun” and this one has survived until today. Until July, there will be a fantastic media façade shows every Thursday and Friday at 9PM and 9:30PM. We used 3D projection mapping technology to light up the night view of Punggnammun Gate. This must leave lasting impression. Aren’t you curious how fantastic the Pungnammun Gate donned with glowing beams will look? A tip) Take a stroll in Nambu Market which is almost 600 years old. A night market is held every Friday and Saturday, from 6PM until 11PM (10PM during winter). Next stop is Gyeonggijeon Palace. The Palace has much to see, including the Taesil (a place for storing placenta and umbilical cord) of King Yejong, Jeonju Archive (that kept the annals of the Joseon Dynasty), Jogyeongmyo (ancestral shrine of Joseon Dynasty), and Royal Portrait Museum. You will need a plenty of time to look around. 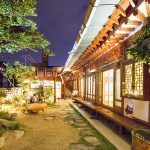 Next to Gyeonggijeon Palace is the culture and tourist center to answer any questions you might have about travelling around Jeonju. Also, Jeonju Hanok Village Culture Market is held next to Gyeonggijeon in weekends. You are welcome to watch, buy, and even participate in the works of handcraft artisans qualified by Jeonju City. Gyeonggijeon Palace harbors the cultural relics of the royal families of Joseon Dynasty. The Palace was built by King Taejong in 1410 to enshrine the portrait of Taejo Yi Seong-gye, the founder of the Joseon Dynasty. The portrait of Taejo is the National Treasure Number 317 and is open for public viewing. Next stop is the Taesil of King Yejong and Jeonju Archive. Taesil is a place that stores the placenta and umbilical cord of a royal descendant. This Taesil moved to the Gyeonggijeon Palace from Wanjugun County in 1970. Nowadays when a baby is born, sometimes the parents make a seal with the umbilical cord. However, back in the days of Joseon Dynasty, they made a monument. How interesting! Jeonju Archive (also called Jeonju Sago) was built in 1439 to store the Annals of the Joseon Dynasty. 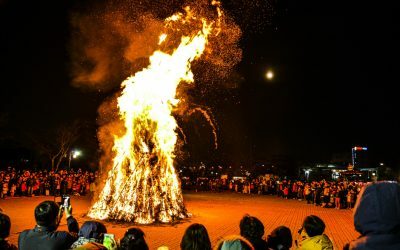 The Annals were almost lost during the Japanese Invasion of 1592, but fortunately they were evacuated to Naejangsan Mountain, located in south of Jeonju. Listed in the UNESCO’s Memory of the World Registry in 1997, the Annals of Jeonju Archive are the only authentic records surviving until today. The Archive has been turned into a museum and is open to public, so that you can learn more about the Annals. Jogyeongmyo is an ancestral shrine where the mortuary tablets of Lee Han, the founder of the Jeonju Lee family are enshrined. One of the tables were handwritten by King Yeongjo himself. During the Japanese colonization period, most of the buildings in Gyeonggijeon Palace were dismantled except for Jeongjeon (the main hall) and Jogyeongmyo. However, many buildings of the Palace have been restored now. The Royal Portrait Museum is a rather new attraction to Gyeonggijeon Palace that opened in November 2011. The museum is the only one of the kind that exhibits the royal portraits including the portrait of Taejo, the founder of the Joseon Dynasty. The miniature sized models of the portrait enshrinement parades are on display too. Also, don’t miss the interesting collections in the special exhibition chamber! 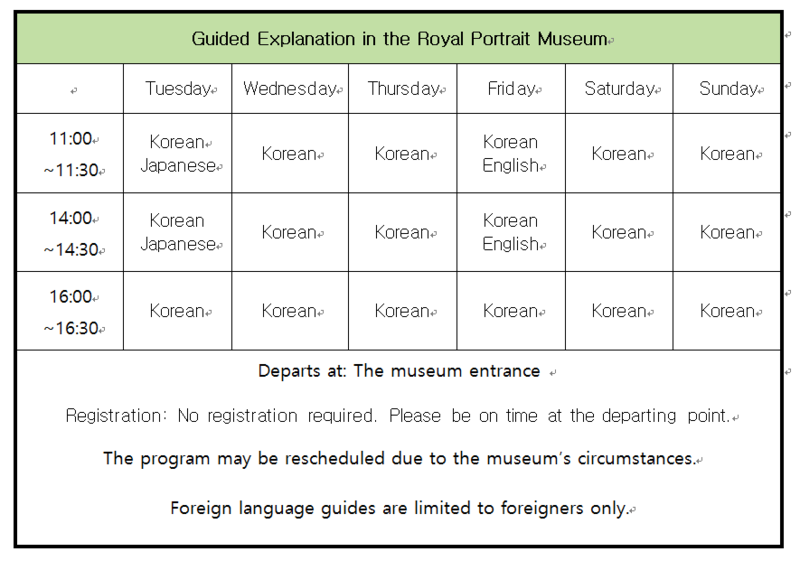 The Royal Portrait Museum offers explanations in Korean, Japanese, and English. 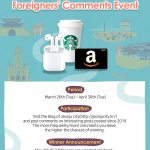 Must be a great experience for overseas tourists and their friends! A tip) When you visit Gyeonggijeon Palace, don’t forget to visit the newly restored buildings. On weekends from 10AM to 5PM, during March till June and September till November (weekdays and weekends during July to August, except for Mondays), the Palace offers various fun activities such as wearing the royal family costumes, the royal portrait style face painting, the palanquin ride and others. The last stop is Omokdae. It’s a historic spot where Yi Seong-gye, the founder of the Joseon Dynasty, held a banquet celebrating a huge triumph against the Japanese invaders. You can also find the monument on which Emperor Gojong’s handwritings are written. You can walk up the historical trail behind the Jeonju Craftworks Exhibition Hall to Omokdae. Halfway up the hill, the panoramic view of the Hanok Village is great. In the evening, you can see the nightview of the village glowing in the dark. Many locals and tourists rest in Omokdae pavilion. The wind blowing through the lush forests will dry off the heat. A tip) On the east of Omokdae, just a short walk past the overpass is Jaman Mural Village and Imokdae. You will find many photogenic spots in the village. 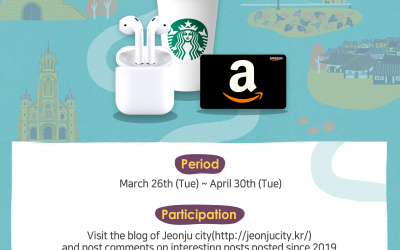 How did you like the Jeonju tour with stories? Visit and explore the birthplace of Joseon Dynasty with your families and friends! 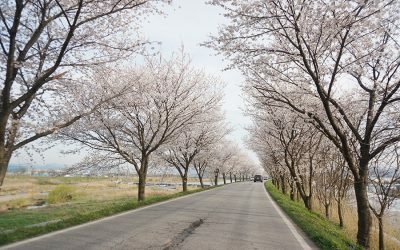 I would love to visit there and feel like I’ve been transported back to the Joseon dynasty!